My friend, John Hartley, ex-ABC producer, enjoyed and was stimulated by your talk at Noosa yesterday after I encouraged him to attend. I have completed 50 years in journalism, starting with hot metal on a Victorian country newspaper (e.g a newspaper in country Victoria!) so I am only one step removed from Caxton - in fact in 1959 we actually used wooden type faces for setting up our hand-cranked posters. Some of our journalists thought one of our posters RECORD SALT HARVEST rather over stated economic reality! I have been asked to give a talk to the local writers' group on how to prepare a Media Release and I will be demonstrating the wonderful list of items which can come from the one basic release - direct mail, leaflet, brochure, speech - the list goes for ever. The simplicity of Copy a Document on Word is the key! No more key striking. Being brought up on broadsheet newspaper, that habit dies hard so all the up-coming electronics such as e-books, e-tablets and so on do not excite me but I note our son, 40, has never picked up a newspaper in his life, but uses TV, net and magazines for his info. That said, my word processor and Google are like Gold to me. Also, being a journalist, filing comes hard, so the use of my computer to place everything in an orderly system for instant recovery any time exceeds Heaven. 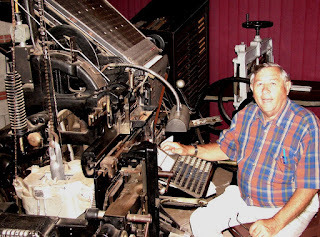 I am pictured sitting at a linotype in our local museum. Best wishes during your stay in Australia.